The high-risk of relapse in patients (pts) with diffuse large B-cell lymphoma (DLBCL) who achieved a complete response (CR) to first-line rituximab-based chemotherapy (R-chemo) highlights the need for effective treatments to improve outcomes. The phase 3 PILLAR-2 (NCT00790036) study aimed to reduce DLBCL relapse after 1 year of adjuvant everolimus (EVE) treatment to poor-risk patients (International Prognostic Index [IPI] ≥3) who had achieved a CR with R-chemo. Pts with histologically confirmed stage III/IV poor-risk (IPI ≥3) DLBLC who had a PET/CT-confirmed CR to first-line R-chemo were randomized 1:1 to EVE 10 mg/day or placebo (PBO) for 1 year or until disease relapse, unacceptable toxicity, or death. The primary endpoint was disease-free survival (DFS) by local assessment using revised IWRC. Secondary endpoints were overall survival (OS), lymphoma-specific survival (LSS), and safety. Enrolled pts (N = 742) were randomly assigned to EVE (n = 372) or PBO (n = 370). Among randomized pts, 48% in the EVE arm and 67% in the PBO arm completed study treatment per protocol. The main reasons for discontinuation were AEs (EVE, 30%; PBO, 12%) and relapsed disease (EVE, 7%; PBO, 13%). Median follow-up was 50.4 months (range, 24.0–76.9 months). Overall, 47% of pts were ≥65 years, 50% were men, and 42% had an IPI of 4+5. In the primary analysis DFS was not significantly different between EVE and PBO (Log-rank p = 0.276). The 2-year DFS rates (95% CI) were 78% (73-82%) with EVE and 77% (72-81%) with PBO. The 2-year OS rates were 91% with EVE and 88% with PBO (Hazard Ratio [HR], 0.75; 95% CI: 0.51-1.10). 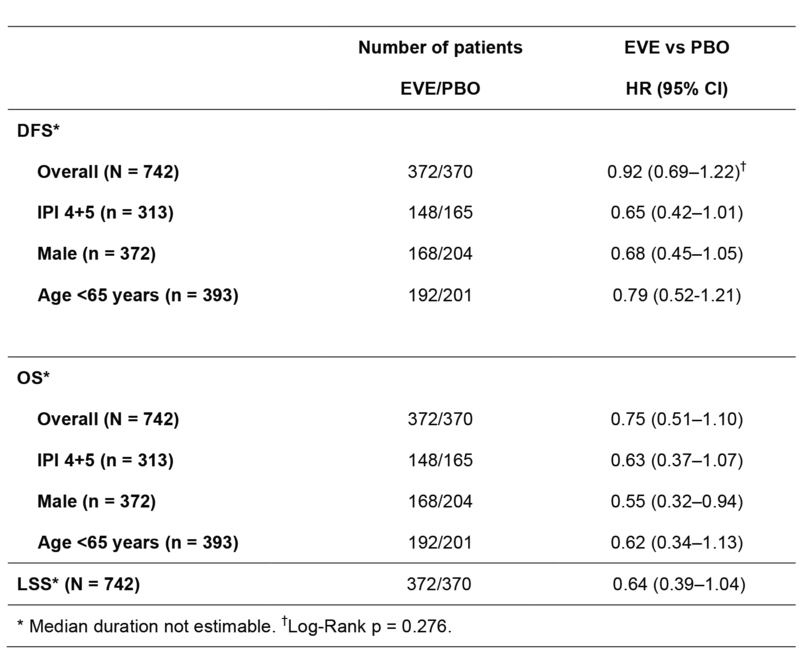 Results of exploratory subgroup analyses showed a trend favoring EVE over PBO for both DFS and OS in pts with IPI 4+5, in males, and in pts <65 years of age (Table). There was also a trend favoring EVE over PBO for LSS (Table). Common grade 3/4 AEs with > 3% difference for EVE vs PBO included neutropenia, stomatitis, CD4 lymphocytes decreased, lymphopenia and anemia. During study treatment, 5 pts in the EVE arm and 2 pts in the PBO arm died. Adjuvant EVE for 1 year did not improve DFS in poor-risk pts with DLBCL who achieved a CR after R-chemo. Trends favoring adjuvant EVE for DFS and OS in selected pt subgroups and for LSS in the overall population suggest that EVE may provide anti-lymphoma activity in poor-risk DLBCL that warrants further investigation.